It means to diet, though not any old diet, but a Victorian precursor of the fashionable Atkins high-protein diet. Few people know it was anticipated by William Banting, in Victorian times a London cabinet maker and undertaker to royalty (his firm buried Prince Albert, for example, and years later his sons organised the funeral of Queen Victoria). Banting was overweight, but neither diet nor exercise helped him. Finally he consulted a doctor, who told him to cut out carbohydrates from his diet. 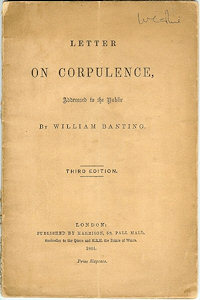 This was so successful that Mr Banting published a booklet in 1864, A Letter on Corpulence Addressed to the Public, extolling its virtues, which sold some 60,000 copies (he made no money from this, not wanting to profit from sufferers; he gave early printings away and the income from later editions was donated to medical charities). His diet became as widely known and controversial in Britain (and later in America) as the Atkins one is in our century, so much so that people took his name to be a participle and created from it — by a process called back-formation — the verb to bant. (By this he joined a significant company of men, two of the others being Boycott and Pasteur, whose names have been turned into verbs.) However, it was commonly used for any sort of diet, not necessarily one that conformed to Banting’s precepts. Even in comparatively recent times, the word had not quite vanished from the language. Jonathan McColl (who provoked this piece) found it in The Satanist by Dennis Wheatley, dated 1960: “She felt ill owing to a combination of overwork and banting”. People who know Swedish tell me that it is the usual word in that language for dieting; Mr Banting’s influence seems to have travelled further than he probably ever knew. Last modified: 11 October 2003.